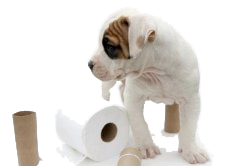 Puppies have small bladders and most are not physically able to hold the urine for more than a few hours until they are over twelve weeks old. Take your puppy outside frequently; initially every couple of hours gradually increasing to every four hours. Regardless of the frequency of other trips outside, take your puppy out 10 to 20 minutes after eating. Meals stimulate the need to pass stool. Watch for behaviors (pacing, whining, circling, abruptly stopping another behavior) which tell you your dog may be ready to eliminate. When seen, take your puppy outside immediately. Also take your puppy out immediately after any play or naps and if it awakens at night. Prepare for the first walk of the day fully dressed for the outdoors. Puppies that have made it through the night cannot wait long once you are awake. If you have an older dog that is house trained, take it with you when you take the puppy out. Dogs learn well by observing. Everyone in the home should be giving the puppy the same command to "go potty" outside. The simpler the command, the better (no more than two or three syllables, such as, "Go potty" or even better just "Potty"). Use whatever phrase you decide on before your puppy squats and while the puppy is urinating or defecating. Immediately reward the successful behavior with a tasty treat and a phrase such as, "Good potty!" If your dog likes to be outside and you bring him/her inside immediately after going potty outside, it may take your puppy longer and longer to urinate or defecate. The puppy learns that as soon as it eliminates it has to go back inside. Therefore spend at least a minute or two playing with your puppy outside after a successful outside potty. Remember that puppies are more susceptible to parasites and diseases than adult dogs. Other than for puppy socialization classes and visiting our animal hospital, keep your puppy only on your property until after his/her final Distemper - Parvo vaccine, which is usually at about four months old. Our veterinarian recommends using a dog crate as an essential step in the housebreaking process. Please refer to our Crate Training page.